While I approach God with reverence and awe because he is the holy and majestic God, I don't have to fear his presence. Because of Jesus and the Holy Spirit, I know God is my Abba Father. He longs for me to draw near him. He has shown me his heart by sending Jesus. He has shown me his love by having Jesus die for me. If he loves me that much, then I can trust that his desire is to save and bless me. I don't have to fear his presence or his judgment. 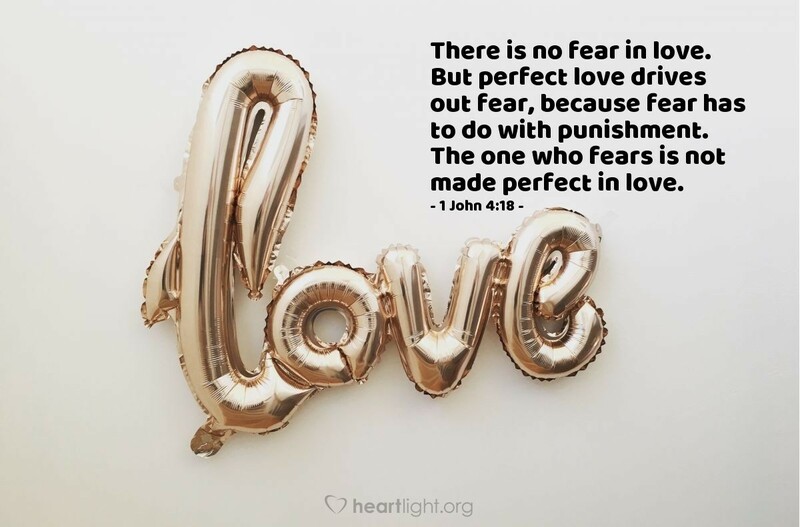 As his child, his love has driven fear from my heart and replaced it with love from his abiding presence, the Holy Spirit. Holy and Righteous Father, I thank you for your overwhelming love demonstrated to me in Jesus. I thank you for providing the atoning sacrifice for my sins and for adopting me into your family. Father, please cast all fear from my heart and help me walk confidently with you and for you, with character and purpose. In Jesus' name I pray. Amen.